Most of us have things we’d like to change about ourselves. Those things may be major or minor, realistic or unrealistic. As a girl I always wanted to have blue eyes and I wished I wasn’t so tall. Obviously those things aren’t going to change permanently. I’m not talking about self-hatred or low self esteem. I’m referring to a healthy desire to improve ourselves and grow and change as human beings. We see things in our character or our habits, or we admit that we have physical issues that could be improved. It’s a good thing for us to learn and grow and change all of our lives. The trouble is, we want to transform….right now. Never mind that the weight crept on over a period of months, or that we’ve had a sharp tongue for twenty years. We want the microwave version, to be rewarded for our decision to change immediately. If you’re painting a bedroom, it’s pretty easy to make a thorough change in the appearance of the room. Unfortunately, it doesn’t work that way with a human body or a character trait. When we start out on a self-improvement project, we expect rapid, predictable results from our efforts. And when things go wrong, we think we’re entitled to the stress and disappointment we feel. Fact: When we care too much about life conforming to our expectations, we’re setting ourselves up for disappointment. 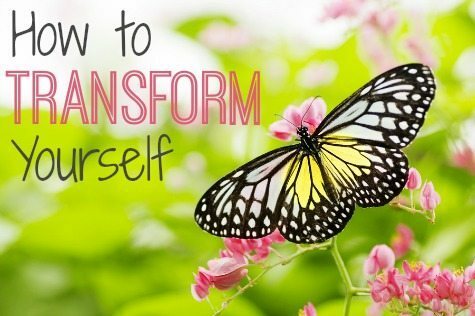 So how DO you transform yourself? Limit the number of changes you attempt at one time. In other words, start a new exercise program (and I highly recommend T-Tapp), but don’t begin a new, strict diet at the same time. Know thyself. Be honest. If you know that you won’t do long workouts, don’t plan them. You’d be setting yourself up for guilt and shame. Don’t necessarily announce to the world that you’re changing something. Sometimes we spend so much emotional energy and excitement telling everyone, we feel a sense of satisfaction and our brain thinks we actually already did it. With your energy spent, there’s not any left to push you into action. Make changes gradually whenever possible. Be wary of inflicting stress-inducing, rapid change on yourself. Stay aware of how you are handling the transformation effort. Incremental change is easier to accept. Use tools to organize your change efforts. Checklists are your friend. Checklists don’t lie. They tell the truth about what you have to do and what you’ve actually done. Writing it down gets it out of your head and onto paper. Keep it simple. Big, complicated plans may be fun to make, but they seldom get carried out in ordinary, busy life. That’s one thing that’s so effective about Plexus Slim for weight loss, and helps people stick with it: it’s one pink drink in the morning, go on with your day and eat normally. Instead of focusing on how far you have to go, focus on the next step. Before you know it, you’ll look up and find you’re almost there. The small things add up. Transformation happens in the daily choices. It’s like seeing a teenager whom you haven’t seen since they were a child. To you, the transformation happened overnight. To their family, the change happened daily but they couldn’t see it. Take heart, transformer! Your efforts are paying off, even if your eyes don’t detect the change. Your character is transforming in the hard things, slow as it may seem. The change can be dramatic….but not necessarily sudden. Oh how I needed to read this post today!! Thank you once again for writing such a wonderful post! !